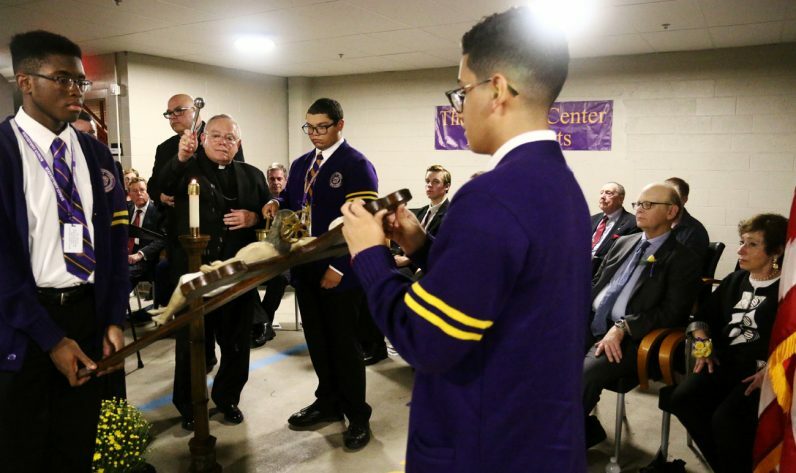 Holy water was superfluous on Wednesday, Sept. 18 when Archbishop Charles Chaput visited Roman Catholic High School in Philadelphia to dedicate its new Howard Center for the Arts, located a block east of the school’s historic main building. Mother Nature blessed the afternoon with more than enough moisture to last well into the future. The 40,000-square-foot center, located in a repurposed warehouse, looks from the exterior like, well, a warehouse. Which proves you really can’t judge a book by its cover. The totally remodeled upper floors are dedicated to the fine and performing arts and digital photography and videography. It has rehearsal space for music and choral students, along with individual lesson rooms, choral and ceramic studios, classroom space for drama and mixed media, a computer-aided design lab, storage space for instruments and offices for instructors. Let’s not forget the clay kilns and virtual imaging software. The lower floor, where the dedication ceremony was held, will be a parking garage for 50 cars, which will free up the current parking lot for future extensions to the main building that are already on the drawing board. In his remarks Archbishop Chaput praised Barry and Elayne Howard, whose generosity made the new Center for the Arts possible. Not to be outdone, the alumni association named Barry Howard a True Son of Thomas Cahill, the self-made 19th-century coal and ice tycoon whose generous endowment made Roman Catholic possible. In 1890 Roman was the nation’s first free Catholic diocesan high school. Howard, who has been assisting Roman Catholic for a quarter-century, explained after the ceremony why he volunteers there, even though he is not himself Catholic. While Roman Catholic High School is clearly doing well today that was not always the case. When it was founded it accepted students from anywhere in the Philadelphia Archdiocese, but as other schools opened in various areas each school became territorial. Located in a once-heavily industrial area of center city at Vine Street and North Broad, Roman’s territory had shrunk to the point it was mostly in those sections of the city where the Catholic population was also shrinking. In 1986, the archdiocese reached the decision the school should close. But there was such an uproar from the very loyal alumni that the archdiocese decided Roman could accept students from anywhere, but would not have a territory. If the school showed growth it could stay open. Against all expectations the alumni succeeded in attracting new students, and together with a series of capable administrators, Roman was put on a path of growth which remains to this day. Father Joseph Bongard, the current president, previously served four years in that role followed by four years at St. Charles Borromeo Seminary before returning to Roman five years ago. The center city location, which some might consider a disadvantage, is really a great advantage that provides many opportunities for the students. For example, Father Bongard lists the many outside options open to the students including programs at the Pennsylvania Academy of Fine Arts, the Philadelphia Museum of Art, the Constitution Center, the Barnes Museum, just to name few. Another example was a recent trip to the Constitution Center when a U.S. Supreme Court justice was speaking, easily done because it’s all in the neighborhood. “Also many students have been able to take advantage of internships at various center city offices,” Father Bongard said. The Howard Center is Phase One of a four-phase plan costing an estimated $25 million. It does not have a defined timeline, but surely will happen, Father Bongard explained. Phase Two will be a new STEM Center for science, technology, engineering and math, and Phase Three will be a new field house and track for sports. Phase Four will repurpose the current gym, which is too small for many sports, into a chapel and auditorium, and provide space for a variety of school offices. Present for the ceremony were a number of old grads, the men who worked so hard to keep Roman open against the odds 32 years ago. Some of the present Sons of Cahill were there for the ceremony. For example there was Tyler Markward, a Roman Catholic junior who is a great-, great-nephew of Billy Markward, the legendary basketball coach who led Roman to 18 championships over 41 years, and is still remembered area-wide through the annual Markward sports trophy. But he’s got one thing in common with his distinguished relative and so many of his classmates. He’s a Son of Cahill and will be for many years to come. 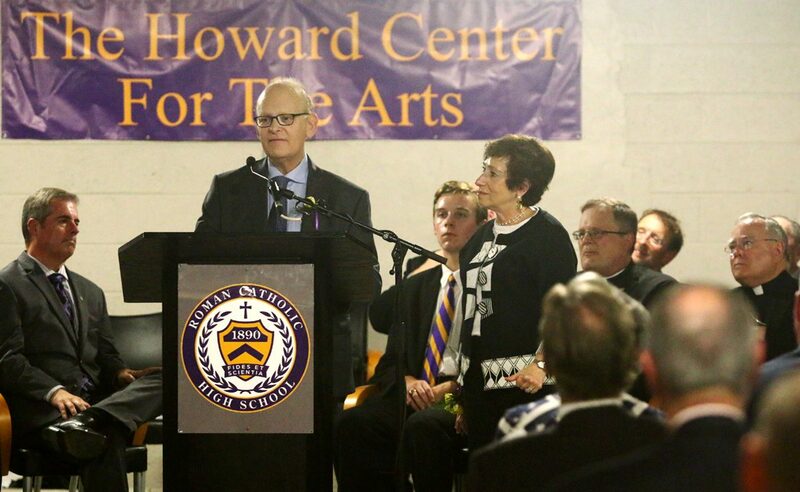 I was absolutely thrilled to be in attendance for the dedication of the Howard Arts Center. What Elayne and Barry Howard have done for Roman is a remarkable achievement – for themselves and the Roman community – and I Thank them sincerely. BTW, Fr Bongard shared with me that the crucifix Blessed by Archbishop Chaput was in the school building for the dedication of Roman by Archbishop John Patrick Ryan on September 6, 1890. Another great man and his wonderful wife step up for RCHS. Count me in to help continue to support our future sons of Cahill. If all of the members of the Philadelphia community would just contribute a small $25 to $100 donation to the FIRST FREE Diocesan CATHOLIC HS. You really can make a difference. Roman Family, is Tradition for over 129 years. Donate in memory of your great grandfather, grandfather, dad, uncle, brother, or cousin. One or more of them probably were Son’s of Cahill like me.